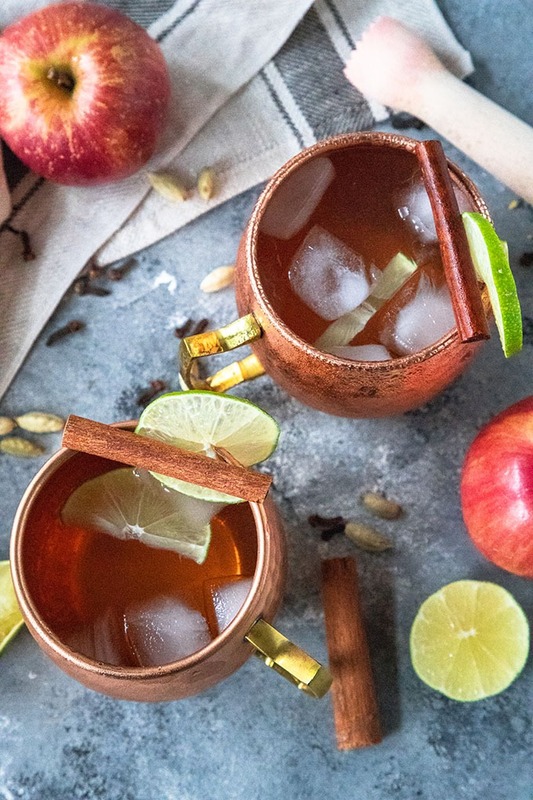 Spiced Apple Cider Moscow Mule – a cozy, spiced cocktail that is full of the flavours of fall. Jazz up your original Moscow Mule with this beauty made with real spiced simple syrup! I’m having a hard time deciding which is my new favourite cocktail for the fall – these new spiced apple cider Moscow Mules, or my honey Grapefruit Gin Cocktail!? I can’t decide, so let’s go with both! I am a huge fan of fall cocktails. If you didn’t see my 15 Fall Cocktails Recipe round-up last week, then be sure to check it out because there is some seriously good cocktail inspiration going on there! I never really thought about fall cocktails, to be honest until a few months back when I was creating my fall content calendar! I was planning out some beautiful seasonal cocktail recipes, and just got so excited about the endless opportunities! An obvious option when I was planning out my content was a Moscow Mule. I mean, come on! They’re SO easy to make and so delicious, I thought it would be the perfect chance to make a seasonal Moscow Mule! I made a Strawberry Basil Mule in the summer which was absolutely delicious, but I absolutely adore how cozy my fall apple cider mule is! Do you want to know what makes mine so different from all the other Apple Cider Moscow Mule recipes out there? It’s the spice! I perfected a spiced simple syrup recipe that just takes these cocktails to the next level and gives them that warmth you’re looking for in the cooler weather! It is an absolute game-changer for this cocktail recipe! 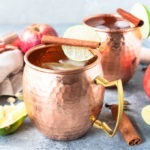 So How Can You Make These Apple Cider Moscow Mules? If you’re unfamiliar with a Moscow Mule, it’s typically a combination of vodka, lime and ginger beer. For the different seasons though I love adding new ingredients to give it a bit of an upgrade from the norm! As I did in this Fall Moscow Mule! My top tip for creating a Moscow Mule is to use good quality ingredients. You’ll need good quality vodka, good quality ginger beer, fresh lime and an apple cider or apple juice that isn’t overly sweet. On top of that, you’ll need your spiced simple syrup. This spiced simple syrup is very easy to make, like most simple syrups. You start with a simple 1:1 ratio of sugar and water, and infuse it with a variety of different spices. I use; cinnamon quills, crushed cardamom pods, whole cloves, and a star anise. All these spices can be found in local supermarkets very easily and at a relatively low cost. Bonus, they’re also the basis for my German mulled wine, so it’s always a good idea to keep these spices in stock over the fall and winter! To make the syrup, I heat the sugar, water and spiced together until the sugar has dissolved, then remove it from the heat and let it stand for 10 minutes to let the spices infuse. The smell is amazing and infusing the syrup really lets the flavours develop. Once they’re infused, you’ll want to strain your simple syrup into a little mason jar, ready to be used. Now, this is the fun part! I start by adding my ice, then add my vodka, simple syrup, apple juice and lime then top it up with ginger beer. For this particular recipe, I used a standard size copper mug. 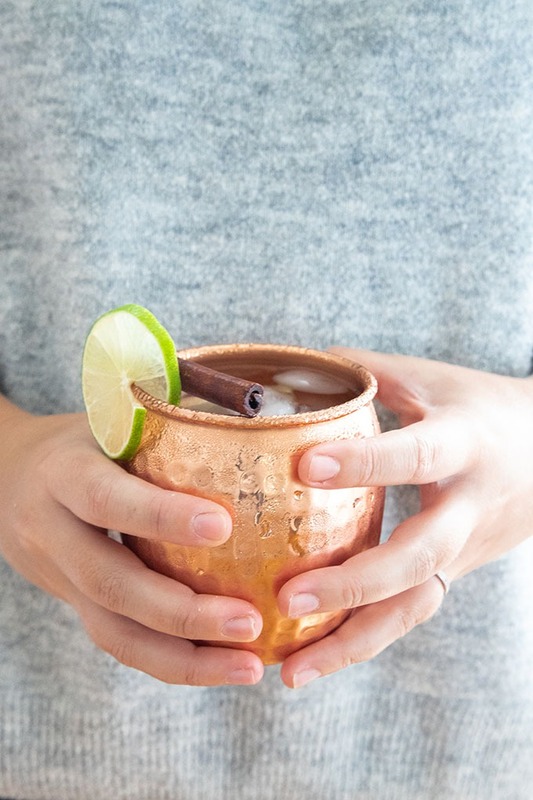 The copper mug really does make a difference to the taste of your mule (they keep them super cold), however, if you don’t have a copper Mule mug, a regular 16 oz glass will do! 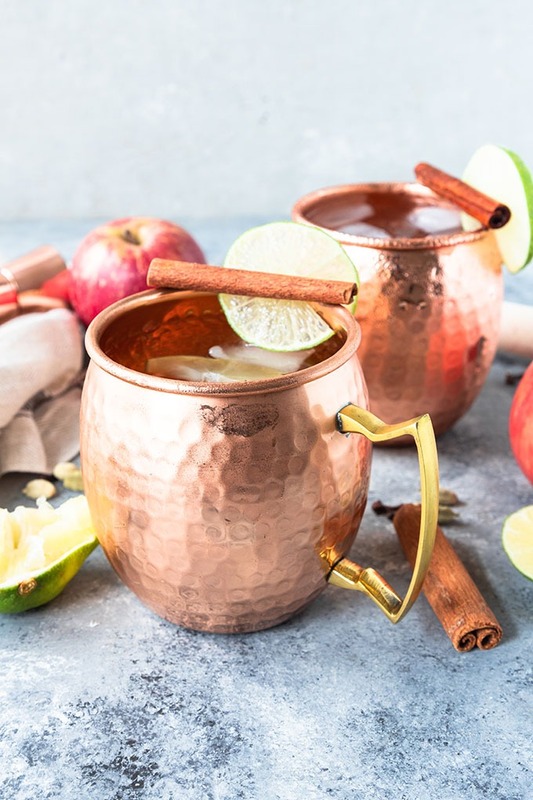 To finish off, I love to garnish mine with a wedge of apple, a slice of lime and a cinnamon stick so you can stir your mule and infuse more cinnamon flavour into them! This cocktail is great for a fall dinner party or when you’re in the mood for a cozy cocktail on a Saturday night! Despite the fresh taste, this is beautiful cozy and comforting and so easy to whip up in less than 20 minutes! 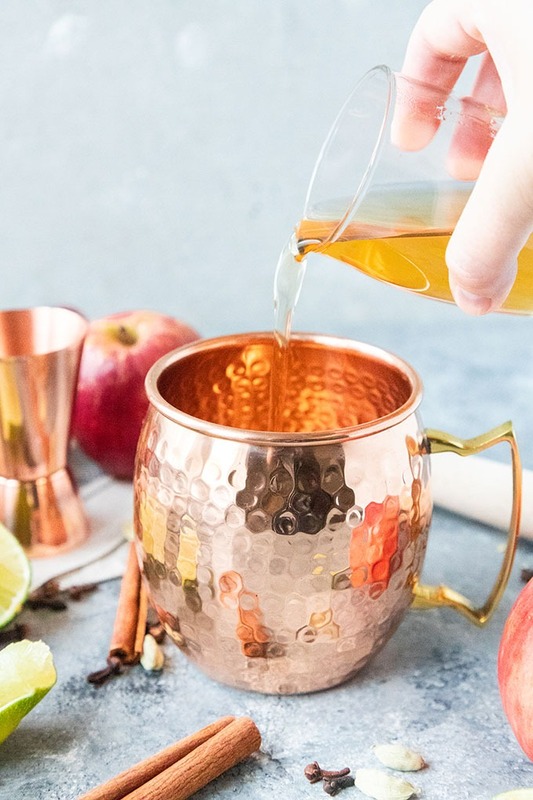 This spiced apple cider Moscow Mule is perfect for a fall dinner party. Cozy, yet refreshing, this Mule is fall in a cocktail! Combine all ingredients in a small saucepan, and heat on low to medium until the sugar dissolves. Remove from heat and let it stand for 10 minutes so that the flavours can infuse. Remove cinnamon sticks, and strain the syrup into an air-tight jar or container. 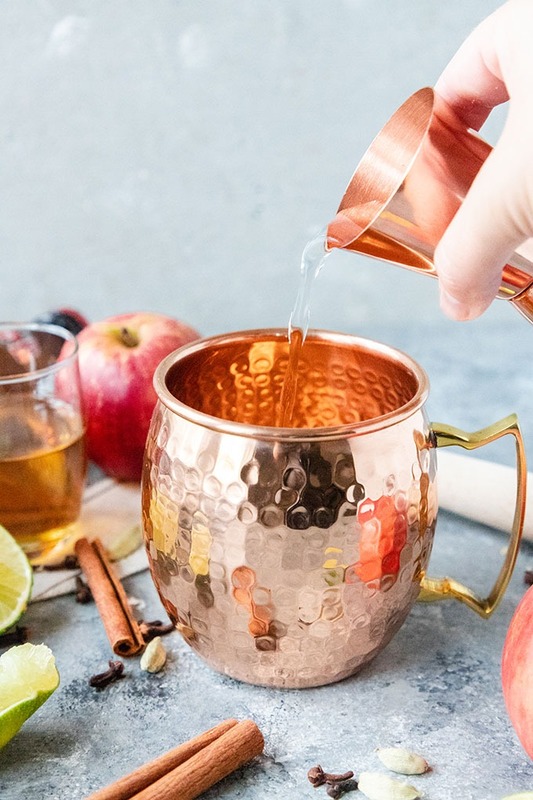 Add ice to a copper Moscow Mule mug. Add vodka, lime juice, simple syrup, then top with the apple cider and ginger beer. 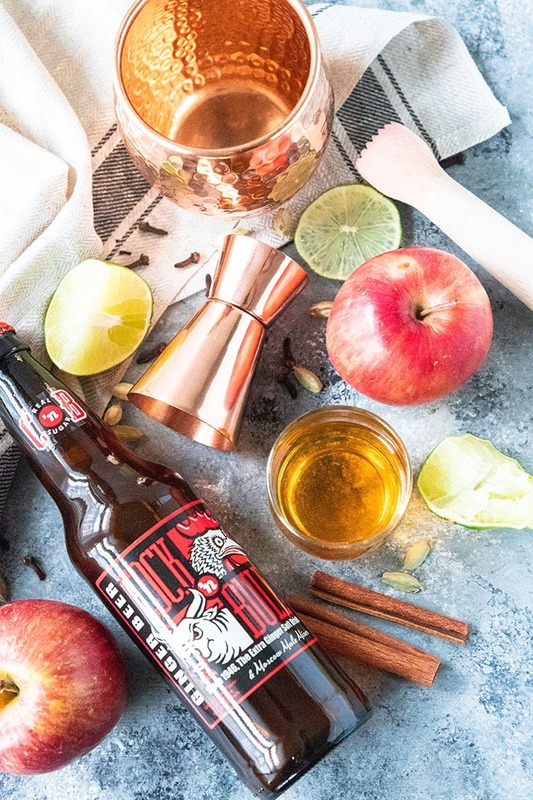 I’ll take spiced apple everything this time of year – this sounds delicious! thanks Lisa! spiced everything is for me too! we have the most gorgeous spiced candle, makes our house smell amazing! My husband will love this recipe, especially with the copper mug. He is a big fan of mules. Mules are my favourite too! and I love that the copper mugs keep them cold too! The perfect fall cocktail! Can’t wait to try one! thanks Tisha, they are so lovely on a cold weekend afternoon! I love a good moscow mule and this one in particular look so delish for fall. Cozy! thanks Cindy, it’s so perfect for a cold day! Georgie, this sounds so good – I love that your spices set this apart! And your photos are so pretty, too – makes me wish I were there in person to share this lovely drink with you and enjoy some falling leaves! thanks Monica 🙂 I wish we could share one together too! aww thanks so much Valentina, cocktails are always so fun to shoot!